Spring is here! Gardening time! With spring time here, it’s gardening time again. For me spring also means a new round of author appearances to talk about the benefits of gardening with kids. School gardens are classrooms that are hands-on laboratories where kids can learn about the and celebrate the cycles of life through observation, experimentation and reflection. Right now I am celebrating spring by working on a curriculum guide that will tie Our School Garden! to the Common Core. Look for that soon! I am also celebrating spring by planting my own garden and by watching some of my winter vegetables start to go to seed–a great time to frizzle them up in some olive oil! 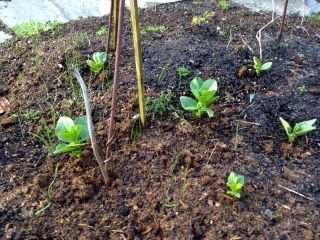 My fava is now sprouting (see photo) and I look forward to having the leaves (prepare like spinach!) and then the fresh beans right about the beginning of summer. My rhubarb is up now, too. It’s almost pie time! Come see me at Family Day: Food for Good http://gates.ly/foodforgood on Saturday, April 5th. I’ll be presenting at the Gates Foundation Visitor Center at 12:45. Discover how to grow, prepare, and enjoy healthy foods from around the world through fun activities, music and storytelling. Community organizations will demonstrate how food gets from the farm to the table locally and globally. Learn how kids of all ages can make a difference through fun and exciting volunteer programs. It’s FREE! ← Will Allen comes to Seattle and more!